I got started an hour late today, so by 3pm I only had 4100 words. Then, most awfully, I noticed it was only another 1100 words to 20K on the book, so obviously the day's goal was not 5K, but 5200 words. And at 3pm I *reaaaaaaalllllly* didn't feel like writing anymore. So I came downstairs to log on and whine, and found that Ted had sent me a copy of the Rogue poster for X3. 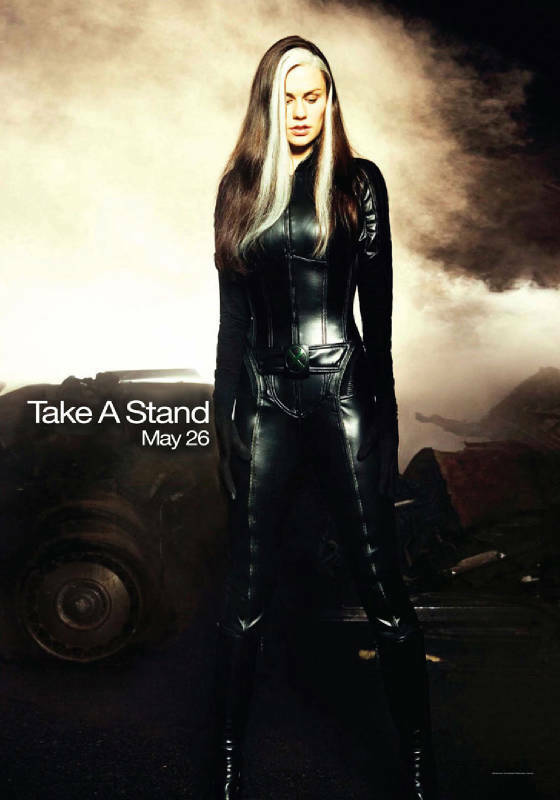 However, it was an excellent poster to make my Rogue X3 Take A Stand graphic with, because I was deeply bitter that they had Storm and Angel and Phoenix but no Rogue, and I had a good positive/negative for her. So I made the icon that is currently displaying on this entry, and I am inordinantly pleased with it. I have not made an animated graphic since 1999, I'm pretty sure. I was somewhat amused to discover the technology hasn't changed. Anyway, so I had this plan: I was gonna do the icon, write my words, get Ted to cook dinner, and dye the not-streaked part of my hair darker brown. Except it took an hour and a freaking half to do the icon. By the time I got it done Ted had already cooked dinner and I was on my way to eat and I hadn't written a single more word. Dinner, however, was insanely yummy and I gobbled it all down post haste and then went back to writing, feeling much better about everything. And I dyed the none-striped part of my hair darker brown (in fact, wet, it looks *black*, so I'm pretty curious about what color it's going to be dry) and I'll go have a pro do the stripe blonde on the 24th or so, and it'll be fun even if it's not long enough. And I walked the dog, so I'm not a total failure as a human being. My livejournal icons aren't very good. And I paid actual money for extra slots and everything. It's sad. I'm one or two icon spaces short of having to pay actual money for extra slots. I'd been going to a couple months ago, but then they went and did the extra icons for paid accounts thing and I've only just almost run up against my limit of those. But now I've got a gif animator. The world should tremble at my feet! LJ has very recently made some major upgrades to their image upload tools, so now they can auto-resize things bigger than 100x100. I assume it'd work for animated gifs too. I don't know if it addresses the 40k thing at all, but probably. It's not that hard, once you're mucking around with ImageMagick.pm, which is what I assume they're doing. Yay Rogue! Stripe for the win!